Residential Child Care draws on the latest research to offer guidance for developing best practice, policy and improved outcomes for children and young people. Contributors examine important aspects of residential care work, and address the concerns about the poor outcomes for young people leaving care and the role of residential child care as a positive choice within the range of care services. Key issues addressed include promoting well-being and development for young people; tackling potential discrimination in residential policy and practice; responding to areas of discord in residential child care; and underpinning themes relating to residential child care, such as staff development and support. This book will provide essential reading for policy makers, managers and practitioners in residential care and the social services, and students in the field. Contributions examine a number of recurring themes and pay particular attention to the importance of the relationship between young people and residential staff members. 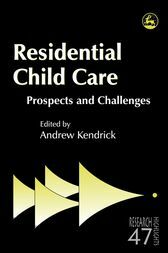 This book is an essential addition to the literature on residential child care.